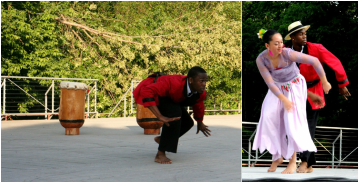 This dance is inspired by the old Malagasy story of Tsingory, a talented young man who has gone through an exciting but frightening journey to become a regular entertainer for the Royal Palace. In our interpretation of the story, Tsingory meets two new friends, two ladies with flirty and coquettish personalities. Throughout the dance there is a constant playfulness, and even a bit of competition, between Tsingory and the two girls. 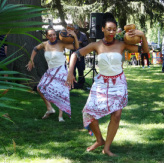 This dance is of the Vakondrazana genre and is from the capital of Madagascar: Antananarivo. We use the Sodina (authentic flute of Madagascar), Langoraona, and Amponga be in this piece. The Danse du Sud is a dance full of energy and jumps, inspired by the province of Tulear. This dance shows everyday life of the villagers; raising animals and the way they defend themselves against intruders. It is the driest part of the island and it is very hot. Sacred Lake is our interpretation of the sacred lake with its crocodiles in the northwest part of Madagascar. The locals believe that these crocodiles carry the spirits of their ancestors and have deep respect for them in this particular river, Anivorano. Dances and music are performed to call the crocodiles on shore before feeding them. 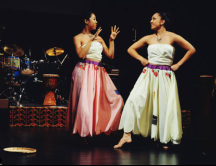 The Rice Dance is a fluid dance with lots of hip and arm movements. This dance depicts the task of growing rice specific to women. It is an extension of the traditional Salegy dance of Madagascar. The traditional costumes usually consist of “Lambahoany”, a rectangular and colourful cloth with horizontal writing towards the hem. This cloth is wrapped around the waist. It is still made of locally woven cotton. The kings of Salegy music are Jaojoby and Mily Clement. Both of these musicians are still very popular in the Indian Ocean Islands and overseas. Rice is the national staple of Madagascar. The Salegy Groove is a dance which includes the numerous styles of the salegy dance found in Madagascar. This fun, upbeat dance features a cast of three dancers who groove together to the sounds of the island. Salegy Groove is about loving life, loving the island, and just having a good time. IMPORTANT: The dances performed by Tsingory Dance are original. They are choreographed by Lanto and Jennifer Morse and property of Tsingory Dance. Any replication, duplication, or reproduction is PROHIBITED without the written consent of Lanto Morse.